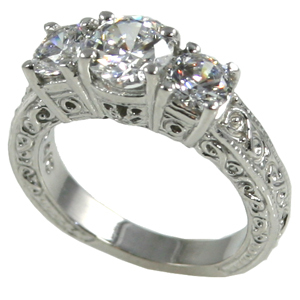 Stock #PLA105:Immaculate Platinum 3 Stone Antique Deco Style Ring. Beautiful Hand-Made item. Featuring a 1 carat center stone. Perfectly accented by 2- .50ct side stones for a total of 2 ct. This piece very is heavy. This item can be ordered blank (ready for your stones) or set with our Fine Russian Cubic Zirconia (additional cost). Also available in 14k White Gold or 14k Yellow Gold.